What will be offered at the farm? 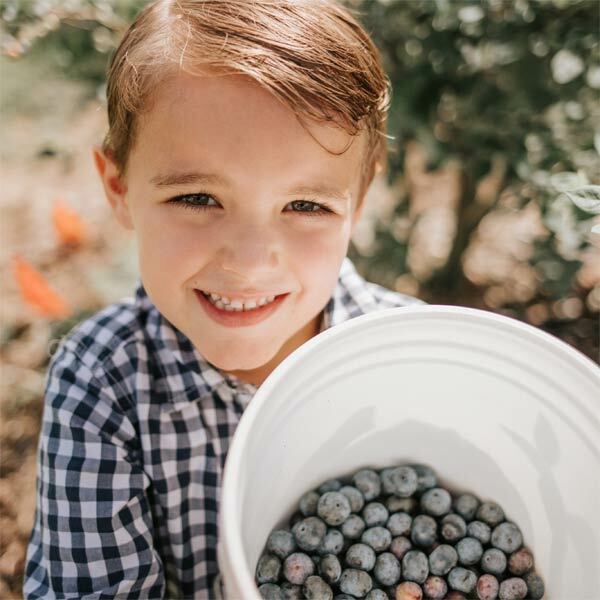 Forty acres of blueberry picking with eight varieties to choose from. You’ll find gorgeous photo opportunities around every corner. Enjoy lunch from one of the food trucks, Twisted Plates, Bauer-BQ, Peru Power & Southern Hill Eatery. Lunch is served from 10:30 am to 3:30 pm. Live music by Dane Colbert, playing from 10:30 am to 2:30 pm. Local craft beer, wine, hard seltzer, light beer, frozen concoctions and blueberry mimosas from our Beer Shed. Blueberry donuts, cobbler, muffins and more seasonal treats from our bakery, Southern Hill Sweets. Shop our own handcrafted goodies in our Southern Hill Market. Think raw, unfiltered honey, hand poured candles and handmade sugar scrubs. Rooftop deck with stunning views of the surrounding farm land. Complimentary yard games for your whole family. Covered playground for children to stay and play. Permanent restrooms with baby changing tables. Picnic tables under our covered barns. First come, first served. Farm wagon rides and Blueberry Express tickets available for purchase. Visit our FAQs for more information about the farm and things to do. There will be no pre-picked blueberries available for purchase this weekend. $2/lb frozen blueberries (packaged in approximately 4 to 5 lb bags). You’re responsible for paying for everything that you pick. Cash, debit and all major credit cards accepted. Please keep the following in mind. Due to Federal and State food safety regulations there cannot be animals of any kind on the farm or in the blueberry fields. No outside alcohol, coolers and catered meals allowed. Schofield Road is a Lake County clay road. Southern Hill Farms is a working farm, you will be parking and walking in grass and unpaved areas. All events are subject to change or cancellation due to inclement weather and crop availability. Always check our website on the day of your planned visit for final event details. Hours and directions for our spring u-pick. Address – 16651 Schofield Road, Clermont, FL 34714. Hours – Tuesdays through Sundays, 9 am to 4 pm, late March through May. View directions to the farm.